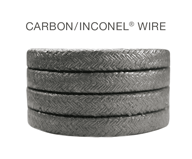 Inconel wire-reinforced spun carbon over homogeneous core. Superior sealability: requiring less operating torque. Corrosion inhibited: reduce valve repair cost. Broad chemical compatibility: reduce inventory costs. Reduce maintenance and production costs. Low friction: Inconel alloy wire is encapsulated in the outer jacket and does not come in contact with the valve stem, virtually eliminating stem wear. Cost effective General Service Valve stem compression packing. High temperature and pressure valve service.